Elective breast surgery is risky. Actually, any surgery is risky. But weighing up the risks versus benefits for an elective surgery is not as straightforward as when the surgery is essential for your survival. Many women, particularly those who are planning to start or grow their family after the surgery, feel that they negate the risk of breast surgery by seeking reassurance they will be able to breastfeed when their children are born – by having implants inserted under muscle, with the incision made at the crease of the base of each breast. As elective breast surgery, including elective breast surgery performed overseas, becomes more common, many seem to have become completely accepting or even dismissive of the other risks involved. It would appear that many women consider the risk of infection so low that it’s barely worth considering. Courtney O’Keefe never thought her breast surgery could result in an infection that could prematurely end her breastfeeding journey, let alone her life. Early in 2011 I lost 35kg after a lap band surgery. The weight loss affected my breasts, so I decided to get implants and a lift. The lowest quote I got in Perth was $22,500, but I could get it done for $7,500 in Thailand at Pattaya Hospital, Bangkok. The plan was to get 350cc implants and I was expecting a small anchor scar (as I was having old breast tissue removed as a part of the lift). Instead, I woke up with cuts straight across my breasts, plus the incisions under my armpits where the surgeon had inserted 550cc implants, not 350cc as we had agreed. I felt like I’d been completely butchered. But the biggest shock was yet to come. I had been feeling unwell since the surgery, but 2 days later I felt extremely sick and I started hallucinating. When the surgeon removed my bandages to remove my stitches, my wounds immediately split open. Please click on this link if you would like to see Courtney’s infected wounds. I came back to Australia and was admitted straight into a local hospital, fighting for my life. Whatever was wrong with me was shutting down my liver, kidneys, brain and heart. The hospital immediately began treating me for golden staph and methicillin-resistant staphylococcus aureus (MRSA), until swab results came back and we learned I had contracted some kind of super bug from Thailand. The infection resisted treatment and my whole body went into some kind of meltdown. I had repeated seizures and losses of consciousness. I spent 4 months in the care of Infections Disease Control, then I was transferred to another hospital to be cared for by Plastics, to treat some of the damage inflicted on my body. I thought I had recovered but the infection came back in November 2015. I was rushed back into hospital. My implants were removed this time, and I was given a partial mastectomy after the implants infected some surrounding tissue and muscle. Again I recovered and gave birth to a beautiful baby girl early in 2017. Miraculously I was able to breastfeed her, and I was so happy! Sadly the infection struck me again when she was only 5 months old and I had to give up breastfeeding while I was being treated. I was, and am completely devastated. 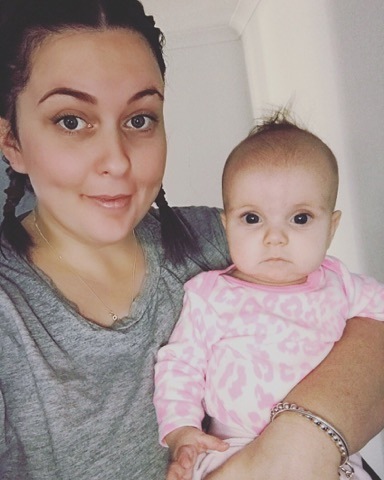 As Courtney’s treatment made it unsafe for her to breastfeed, or even use the undrinkable breastmilk in a bath, she was forced to pump and dump a huge amount. Thanks so much Courtney, for bravely sharing your story with us. 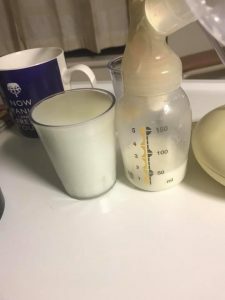 It’s unfair that her breastfeeding journey ended prematurely, but I hope she takes comfort in the knowledge that every breastfeed that she was able to give her baby was a win and the benefits her daughter will reap from those feeds will last a lifetime.